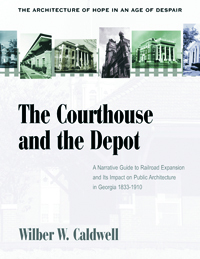 The Courthouse and Depot in Georgia, 1833-1910: The Architecture of Hope in an Age of Despair is a narrative catalog of Georgia’s nineteenth century public architecture and a complete history of the hundreds of rural railroad lines that covered the state in this period. The history of the deep South in the years between 1833 and 1910 is revealed in eloquent and detailed images of hundreds of public buildings. These structures sing of hope, pride, and sweat. Their architecture insists that the arrival of the railroad and the appearance of the tiny depot often created such hope for economic prosperity that people expressed their aspirations with the construction of architectural extravaganzas. Similarly the courthouses evoke ideologies of Old South colliding head-on with the New South. The Courthouse and Depot in Georgia is not an architectural history, but a history narrated by architecture. This is a book about small towns because the South of 1910 was small towns. It is a book about courthouses because, more than any other building of that era, courthouses symbolized the collective self-image of the townspeople. Similarly, it is a book about depots because depots symbolized the hopes for a promising future, and the neglect of these depots symbolizes the disappointment of those hopes.